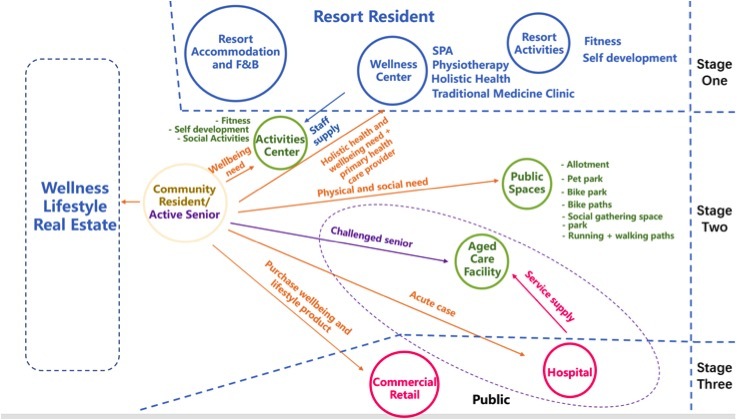 This paper looks at a symbiotic relationship between two business models – a dedicated wellness resort/health resort and a wellness community and looks and the opportunities of developing them together on a green field site. The definition of a dedicated wellness resort here is a resort whose SOLE PURPOSE is to provide guests with lifestyle improvement and health enhancement. Such lifestyle improvements are achieved through professionally administered spa services, physical fitness, health and medical services, educational programming and on-site accommodations. Healthy cuisine is served exclusively. The existing models in the Hospitality/Real Estate Developments were identified as small, first and second home, real estate developments surrounding a health resort with the primary driver of the development being the resort with the homes supplementing investment income. Canyon Ranch Living in Tuscon would be a good example of this kind of wellness community. This discussion paper looks at an extension of this category to a large scale wellness community (upwards of 1000 homes) where the primary driver is the wellness community and the support feature is the dedicated health resort. In a wellness community the hardware (homes, paths, cycling tracks, gardens, allotments, pet park) is relatively comfortable for most developers to include but when it comes to the software, the who and how of the programmes that are run, it becomes a difficult question of how that is managed, paid for and maintained. Yet it is these programmes that ensures the development becomes a wellness community and not a copy of a more typical development where neighbours live in relative isolation. Developing a large wellness community around a health resort, which already utilizes specialist staff for treatments and programmes is that it solves the issue of who and how of the software requirements for the wellness community. Since every dedicated wellness resort has a large number of skilled wellness practitioners/therapists they can be used to support the software requirements of the wellness community (such as facilitating educational, fitness, creative and recreational classes, offering health assessments and private treatments). The dedicated wellness resort bears the primary cost and the wellness community benefit from their expertise at a fraction of the cost of employing the staff directly. Necessarily if we are to attract a large number of first home buyers we need this property to be located within commuting distance to available jobs – either a town or city or large business district. This seems to be in contradiction to the requirement of a wellness resort which is to be located in a pristine, natural environment so that guests can really get away from city life and explore their wellness amongst outstanding natural beauty. Historically whilst most health resorts are in pristine natural environments we have been seeing more dedicated wellness resorts that are closer to cities than we have seen historically (Sha wellness near Alicante) and it is this movement which gives priority to accessibility over the natural environment that can drive this new model of a wellness community forward. The other benefit of the dedicated wellness resort located within the wellness community is that potential buyers can experience a wellness vacation as a way to appreciate the value of moving into such a community. The community can be family focused and/or primarily for senior living. Below is an example of how such a community might interact with various parts. Stage one is the build and fit out of the dedicated wellness resort. Whilst the resort is focused on the wellness tourist for its main business we can also introduce potential buyers to the experience of living in the heart of wellness. Stage two is the construction of the real estate (careful planning is required here to ensure the resort guests are not affected by this build) and the initial occupation by residents. The wellness lifestyle real estate may include apartments, stand alone houses and co-living communities. There are FIVE KEY BENEFITS to this model. Supplementary Income -The Dedicated wellness resort is a for profit business creating long term and ongoing income for the developer. Service Supply/Content - This model provides a high degree of content for the home owners – multiple class types and activities can be offered. 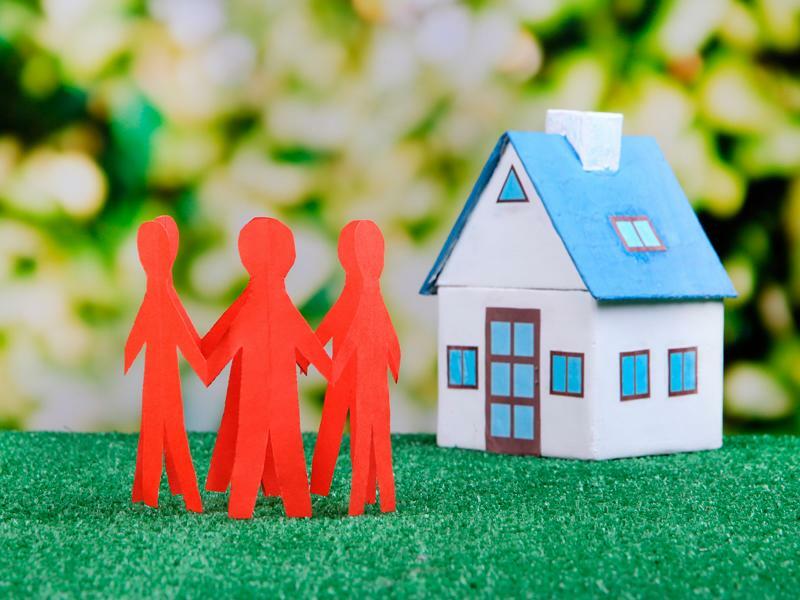 Multiple Components - Multiple components may be put together in this model, each playing a role for the guest, home owner and the general public. The Dedicated Wellness Resort needs to be independently successful, failure of the resort would lead to poor implementation of the wellness content in the community. Since the site may have less access to nature than a typical wellness resort site the resort needs a very strong USP. Pushing the boundaries of the charges home buyers would be willing to make for services. A homeowners fee, wellness fee or membership fee would be essential and could make monthly fees significantly higher than other property developments. The ability to showcase the value of the experience via the wellness resort would help buyers to understand the value of this fee. Discounted rates from the resort services will be essential for home owners requiring co-operation from the third party provider. In conclusion, this model type for a wellness community has a high potential for success, particularly where a development is in natural surroundings on the edge of a large city. Published paper also available online here: https://globalwellnessinstitute.org/wp-content/uploads/2018/07/OnOurMinds_Wellness-Community-Business-Model.pdf. By Joy Menzies and Samantha Foster, on behalf of the Global Wellness Communities Initiative Team.